Welcome to the ATE Central Connection! Published the first Tuesday of each month, the ATE Central Connection is meant to disseminate information to and about ATE centers and projects, providing you with up-to-date ATE news, events, reminders, as well as highlighting new centers, projects, and resources. In addition, we will also highlight an educational topic with complementary resources found within ATE Central to help illustrate how ATE resources can be used in the classroom. The over-arching mission of Providing Opportunities for Women in Energy Related (POWER) Careers is to help women achieve equity in STEM-related technical career fields. POWER Careers will increase enrollment and completion of women in STEM two-year degree programs that lead to energy industry careers. This pilot project is designed to evoke transformational change in the way that women are recruited to and retained in energy systems programs. Education and industry have not been successful in obtaining equitable participation of females in historically male-dominated technical fields. POWER Careers addresses the need to increase female participation, with a focus on non-traditional college-aged women (ages 25+) who need or want to begin a new career. Entry-level energy technician jobs offer attractive salaries, excellent benefits, and career paths with promise and opportunity. POWER Careers implements focused strategies aimed at increasing the successful participation of women in high quality, proven Associate of Applied Science (AAS) programs within the Energy Systems Technology and Education Center (ESTEC) at Idaho State University (ISU) College of Technology. These strategies will retain women students through graduation and placement in professional positions. The project is important because it can help participants make dramatic moves into higher paying STEM-related careers. It will employ a system of supports and activities that form a continuum across the student experience. For ESTEC, the best and most powerful voices to recruit students are those of successful female students and graduates. POWER Careers will serve as a pilot project to help identify and address the challenges of recruiting age-diverse women in a rural area, in part by working closely with program graduates who will be role models and mentors, and with community-based agencies that are in contact with potential adult students. The project engages industry in efforts to build a more diverse workforce and create workplace environments that are welcoming to female technicians. Efforts to recruit women will include those from underrepresented populations - Latinas, Native Americans, and military veterans. This collection of promotional materials from Idaho State University provides information about the Providing Opportunities for Women in Energy Related Careers (POWER Careers) project at the Energy Systems Technology & Education Center (ESTEC) at Idaho State University. POWER Careers seeks to recruit women into ESTEC AAS degree programs and provide women students with additional mentorship and job placement support. This collection consists of three types of promotional materials: billboards, brochures, and fliers. The collection includes two billboards, from the years 2016 and 2017, respectively. For a full description of the materials available, please visit the record. In Texas City, Texas, Christina Smith is going back to school to study process technology at College of the Mainland. Learn more about Christina's new career path, her success in providing for her young daughter, and the role of ATE in helping her move forward. With an emphasis on two-year colleges, the Advanced Technological Education (ATE) program focuses on the education of technicians for the high-technology fields that drive our nation's economy. The program involves partnerships between academic institutions and employers to promote improvement in the education of science and engineering technicians at the undergraduate and secondary school levels. The ATE program supports curriculum development; professional development of college faculty and secondary school teachers; career pathways to two-year colleges from secondary schools and from two-year colleges to four-year institutions; and other activities. Another goal is articulation between two-year and four-year programs for K-12 prospective teachers that focus on technological education. The program also invites proposals focusing on research to advance the knowledge base related to technician education. Nominate your project or someone else's at https://www.research.net/r/ProjNom. The American Association of Community Colleges, a partner on the ATE Collaborative Outreach and Engagement (ACOE) project that includes the ATE Impacts book and blog, has used ATE Impact photos in its digital and print publications, website, and ATE Principal Investigators' Conference displays. The ACOE project has displayed large versions of ATE Impact photos at education and industry conventions. The National Science Foundation, which funds the Advanced Technological Education (ATE) program and the ATE Impacts book and blog, has reprinted ATE Impact photos too. To read more about Pytel and how being featured in ATE Impacts 2018-2019: 25 Years of Advancing Technological Education affected his work, check out the April 1, 2019 ATE Impact Blog post. Well-structured outreach efforts are essential for attracting industry partners and prospective students, increasing institutional presence, and sharing the innovative work of the ATE program and its many hardworking projects and centers. In fact, for those in the ATE community, it’s also a requirement; NSF asks all ATE projects and centers to push out their work fully in order to illustrate the likely broader impacts of research, professional development, and classroom/lab successes. Yet, figuring out the best way to share this information isn’t always easy. Whether it’s a shortage of time, staff, or familiarity with communications best practices, managing outreach activities can be a difficult task. Clear, concise writing and effective communication are essential when attempting to convey the importance and significance of your project or center’s work to the broader community. When engaging with audiences beyond your direct peers or project/center staff, use declarative sentences. An “obvious” fact may not be clear or evident to those less familiar with your work. There is a wide variety of ways to share knowledge and the successes of your project or center’s work. Consider the media available to you, and select the best-fitting option. For instance, Facebook may be the easiest way to share out information, but a well-conceived press release or institutional interview may be much stronger tools for reaching the local community. For more ideas on how to craft an outreach strategy, check out the Planning Guide in ATE Central’s Outreach Kit. The number of first-time degree earners age 25 and older is dropping, but the number of older learners with a previous credential who earn another degree is on the rise. Learn more by visiting DataPoints on the AACC website. Marie Curie, famous for her two Nobel Prizes and her work with radioactive elements, may be one of the most prominent women in the history of chemistry but many other women have also made significant contributions to this field. Here, readers will find nine videos created by the Science History Institute (formerly the Chemical Heritage Foundation) celebrating the contributions of eight of these women chemists. The first video, produced in partnership with WHYY Philadelphia for broadcast in 2013, is an hour-long television documentary showcasing the accomplishments of all eight women. Readers curious to learn more about any of these individuals should check out the remaining eight videos, which comprise a series of 15-minute films that each highlight one of the women and include a brief text description of her background and career. Examples include Stephanie Kwolek, who invented the Kevlar material used in body armor and Paula Hammond, a Professor of Engineering at MIT who researches nanotechnology. Introductory physics students and teachers may appreciate this extensive collection of Physics Interactives available on the well-known website The Physics Classroom. This resource features well over fifty interactive simulations, exercises, and games to help users explore and understand different physics concepts. The interactives are organized by topics such as momentum and collisions; circular motion and gravitation; static electricity; and waves and sound, with most topics containing multiple interactives. Many of the interactives also include a notes page containing teaching ideas, suggestions, and links to related resources (including some classroom-ready printable pages) from other sections of The Physics Classroom to complement the lessons imparted by the interactive. Created using HTML5, the Physics Interactives collection was launched in 2014 with the intent of producing a group of interactive, scalable resources that will work equally well on smartphones, tablets, and Chromebooks in addition to computers. The periodic table of elements is a familiar image for anyone who has spent time in a chemistry classroom, but despite all the information packed into those classic wall posters students today need to understand more than just the elements. This is the inspiration behind Isotopes Matter, a set of interactive educational resources from the International Union of Pure and Applied Chemistry (IUPAC). Visitors to Isotopes Matter will find a colorful interactive periodic table where clicking on each element brings up information on its isotopes, highlights a current use of that element, and links to a PDF with further isotopic information. In addition to this, Isotopes Matter also provides a set of peer-reviewed educational resources about isotopes and their atomic weights, which may be helpful for chemistry learners and teachers alike. Launched in 2016, these resources were created to accompany the IUPAC Isotopic Periodic Table and "designed to communicate the importance of isotopes and their diverse applications, while helping students and educators understand why atomic weight intervals have been introduced for some elements and how they should be used." Do you have some great STEM resources you'd like to share with ATE Central? Email us with your ideas at info@atecentral.net. To read more about the 2019 Showcase, visit the event's website and check out last year's video submissions. Would you like copies of the ATE Impacts book? 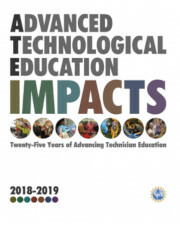 Book orders and general inquiries about ATE Impacts 2018-2019: Twenty-Five Years of Advancing Technician Education can be emailed to info@ateimpacts.net. CWIS is open source software, created with NSF funding, that can help your project or center showcase resources online. It's free and very easy to use. The latest version (CWIS 4.1.1) was released on May 18th and is available for download on the Scout site. Please email cwis@scout.wisc.edu if you have any questions or would like a quick tour of its features!